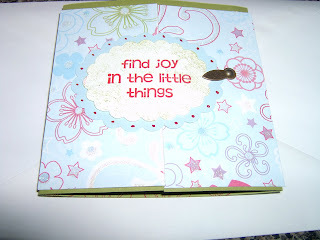 I went to my friend cheryl's yesterday and she wanted to Beate's challenge so I did a 2nd card with her. I used delight in life stamps from su. 0ld olive ink and some glitterpack paper. I used a photo divit(can't remember what its called) from su hodge podge. This worked much better to keep the gate card closed. Let me know what you think and Thanks for stopping by. I forgot to mention that I used the giga and mega scalloped oval for my center piece.